Looking for a Unique wedding gift? Check out this adorable gift from Teddy Delivery. 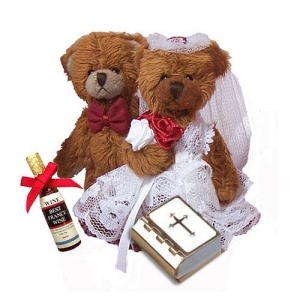 It includes a bride and groom teddy bear, a mini wine bottle and a miniature bible with the complete gospels inside! It is a totally adorable and unique gift at an affordable price. Pick out a free greeting card to go with it and you’ve got yourself an excellent gift.